Automatic push of assignments from School Loop to Google Classroom and vice-versa. Syncing of your rosters in School Loop and Google Classroom by auto-inviting students. Creation of classes in Google Classroom to match your School Loop classes. While the current integration allows teachers to connect their Google Classroom account to their School Loop account and publish assignments created in School Loop to Google Classroom, the process was admittedly blundering. With the new integration, these tasks are virtually seamless. New synchronizing options are also available that will help teachers who use both applications to keep their classrooms connected in sync. When attaching documents in Google Doc, enable the feature 'Copy to each student in Google Classroom' in order to create a copy for each student. By enabling this feature, you can create attachment copies for each student by default in Google Doc. Click on 'Save Draft' or 'Publish'. 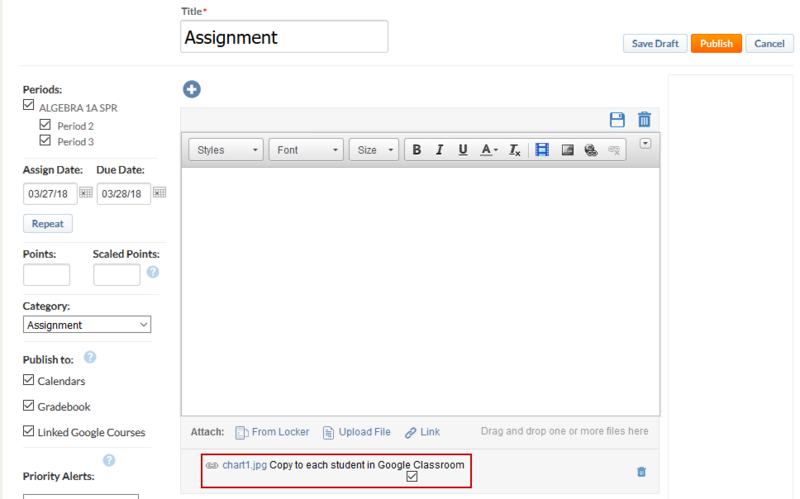 A 'Success' message is displayed once the assignment is now published or saved.